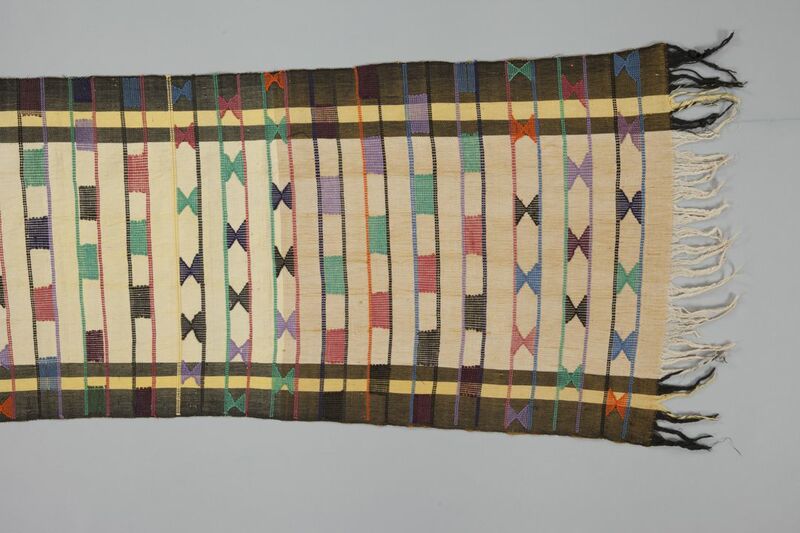 This hand-woven cloth is part of a collection of West African textiles, spindles, hand spun yarn and a thorn carving, collected by Dr C. Marion Petrie. Dr Petrie was an employee of the British Colonial Service in Nigeria and Ghana, in West Africa, between 1957 and 1966. Hand-woven Akwete from the Ibo village of Akwete in Eastern Nigeria. This cloth is made entirely from cotton. The centre of the warp-wise stripes is tan, while the outer warp stripes are dark brown and bright yellow. Half way along the weft changes from tan to yellow. The cloth is decorated at intervals with cotton supplementary weft patterns, in green, red, purple, and dark brown. The supplementary weft designs consist of rectangles, and triangles, which face each other at the point. Both ends of the cloth are decorated with tassels. Handwoven Akwete cloth from the Ibo village of Akwete in Eastern Nigeria. This cloth is made entirely from cotton, with supplementary weft patterning. It was woven in Akwete by a woman on a broad vertical loom, using a continuous warp. It consists entirely of cotton, which is the most common material used in Akwete weavings. The cotton supplementary weft patterning is added over the cotton during the weaving process. Akwete cloths are characterised by the use of supplementary weft patterning. While all cotton used in Akwete weaving was once hand spun and hand dyed by women, today, imported dyed yarns are more common, as reflected in this cloth. This cloth was woven in one piece. Akwete cloths are distinguished from other textiles produced on the vertical loom by their size. Akwete cloth wrappers range from 44 inch to 46 inch matching pairs, which are left separate. This is compared to non- Akwete cloths which are composed of strips of cloth approximately 20 inches wide, and which are sewn together. Both ends of this cloth are tasselled. This decorative effect is achieved by grouping together the ends of the warp threads. This cloth was produced by a female weaver in the Ibo village of Akwete in Eastern Nigeria. This cloth would have been worn as a cloth wrapper. These were mainly worn by women. It was woven during the 1950's or 1960's. During this time, weaving in Akwete shifted from a part time occupation of some women, to a full time occupation of the majority of women. Consequently, girls are taught how to weave Akwete cloth such as this from a very young age. This cloth is part of a collection of 33 objects, consisting of West African textiles, spindles, hand spun yarn and a thorn carving, which were collected in West Africa between 1957 and 1966 by Dr C. Marion Petrie. Dr Petrie was employed by the British Colonial Service in government and university posts in various towns in Nigeria and Ghana. She collected textiles and other items for her own enjoyment in markets and from traders. These objects were subsequently donated to The National Textile Museum of Australia by Mrs. Gillian Moore on January 2 1999. On the closing of The National Textile Museum of Australia, the collection was transferred to the Powerhouse Museum by Ms Maureen Holbrook. According to Mrs Moore, verified by a receipt in her possession, her mother bought all three Akwete cloths in this collection "from a department store in Eastern Nigeria, not long before she finally left Nigeria in 1966".